There is just a bit too much generic auto tuning to make X 100PRE really inescapable. The album is fairly diverse, ranging from rap, reggaeton and trap to pop and moments of gorgeous strings and guitars. Bad Bunny has with 'X 100pre' proven that he can be much more than just latin trap. Even with a fairly consistent production team holding it all together, X 100PRE nonetheless offers sonic surprises. What they invite is to dance - at the expense of the sense of ridicule of oneself, one passes the listening believing to have swag- and / or to sing in almost every moment. The album testifies to his versatility and displays the breadth of genres covered on his previously released singles. Similar to Cardi B’s Invasion of Privacy, X 100PRE maintains an overall consistency such that any of its song might eventually emerge as a bona fide hit. It is near perfect because it the album flows concisely, while offering you plenteous options to DANCE!!!!!!!!!!! The appeal is in his open-mindedness; at first it sounds as if he is just offering a Spanish-language version of slurred, Auto-Tune heavy rap, but listen closer and you will find strains of salsa, soft rock and reggaeton. It’s a great, genre-defying, culturally important album, and proof that one of the biggest singles artists of the last couple years is capable of becoming a highly skilled album artist as well. Bad Bunny released the best album of 2019 before the year even started. All of the groundbreaking variety is tied together by Bad Bunny’s inimitable voice, charisma, and ability to blend depth and irreverence. 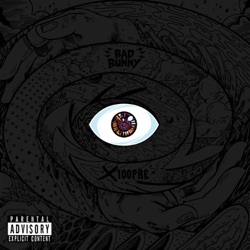 X 100PRE comes into its own when it demonstrates Bad Bunny’s singularity as an artist, even among the current wave of Latin American pop stars. The synthesis of this Pan-Latino perspective is difficult to express in any language, yet X 100PRE’s masterful sequencing somehow manages to weave a diverse arrangement of styles into a coherent statement, one that represents one of the most honest depictions of urbano muisc. With its bangers and sonic diversity, this release suggests that the Latin trap artist possesses the potential to shape mainstream music for years to come. With the release of X100pre, it’s clear that now Bad Bunny has the U.S. music industry’s attention. Better than any album in recent memory, “X 100PRE” speaks to the fluidity of contemporary Latin music. On X100PRE, he cements his place among the elite in Latin pop — and in pop music writ large.